For the first two methods mentioned, be mindful that you are actually running hostile code inside a potentially vulnerable web browser. Make sure to apply the usual precautions (VMWare or the like, deployed far away from any production network you might have, and keeping a keen eye on the firewall log, etc). There are a number of references to other scripts and files in the above code. There is also further obfuscation in the form of hexadecimal code. There are a number of quick ways to convert the hexadecimal to ASCII, either online or with your programming language of choice. As examples, the hexadecimal of the "Rising" variable above translates to "classid", the "Kaspersky" variable represents a specific CLSID, and the "KV2008" variable translates to "Adodb.Stream". We also see a reference to MS06-014, and more. I also decided to download some of the files to see what I was dealing with. The .cab file in particular looked interesting. I downloaded it using wget and then unpacked it using cabextract. This revealed an executable. I also took a quick look with the strings command, which had a few interesting lines. 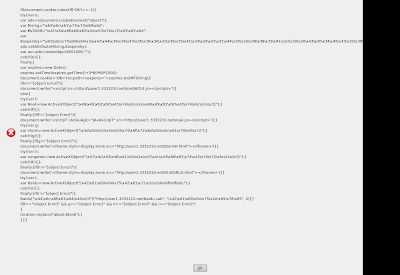 The executable definitely doesn't look like a friendly file. Finally, the results from VirusTotal show that only 18 of the 32 engines detect it as malicious. I would say that 18 out of 32 is ineffective at best, especially considering that one large vendor's product did not detect the file as malicious. This all goes to show that you can get a lot of information with fairly basic procedures. If anyone has a critique or interesting information to add, please post a comment.